In 1913 it was 100 years ago that the Netherlands were liberated from the French. 1913 was also the year of the opening of the Peace Palace in The Hague. Several activities were planned to celebrate the jubilee year. The Amsterdam feminist movement had taken the initiative to organize a women’s exhibition. 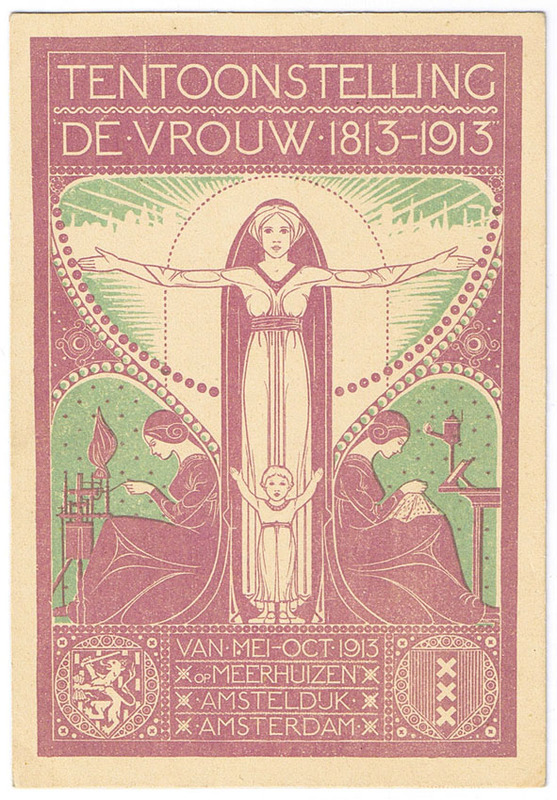 The aim of ‘De Vrouw 1813-1913’ was to show what the Dutch woman had achieved in the 100 years since the liberation. The exhibition drew comparisons between the life and social position of women in 1813 and 1913 in various fields, such as household, suffrage, art, literature, social work, sport and women’s labour. All the decorations and advertising work for the exhibits were made by female artists. Willy Drupsteen (1880-1966) won the design competition for the exhibition poster. Her design ‘Purple and green’ was also used for the cover of the exhibition catalog. 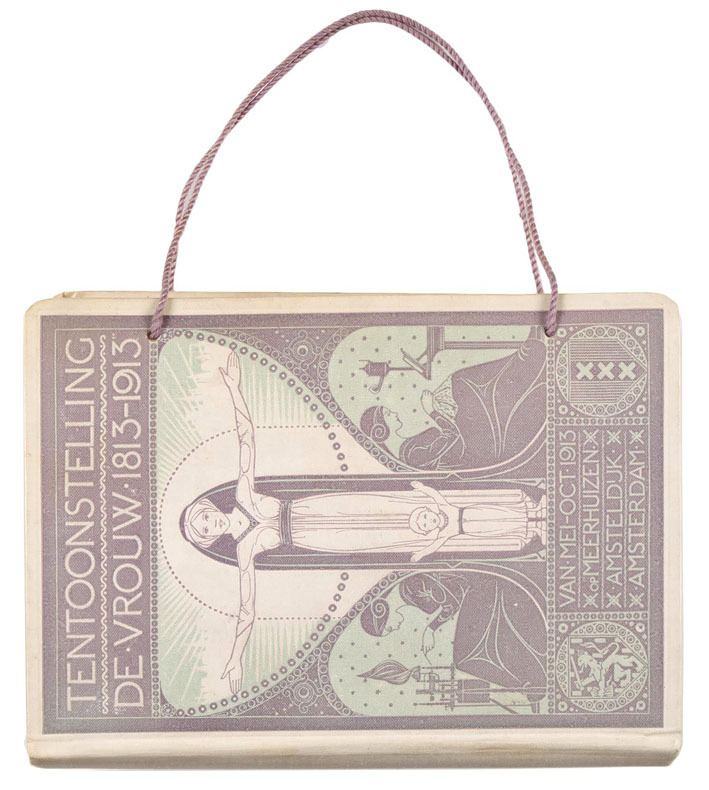 Drupsteen’s design shows the past, present and future of the Dutch woman. In the background we see the plumes of smoke of the modern city, which were seen as a symbol of progress. Drupsteen also made the murals in the entry hall of the exhibition. Funny detail of her catalog are the cords so that the book could be carried as a ladies purse. 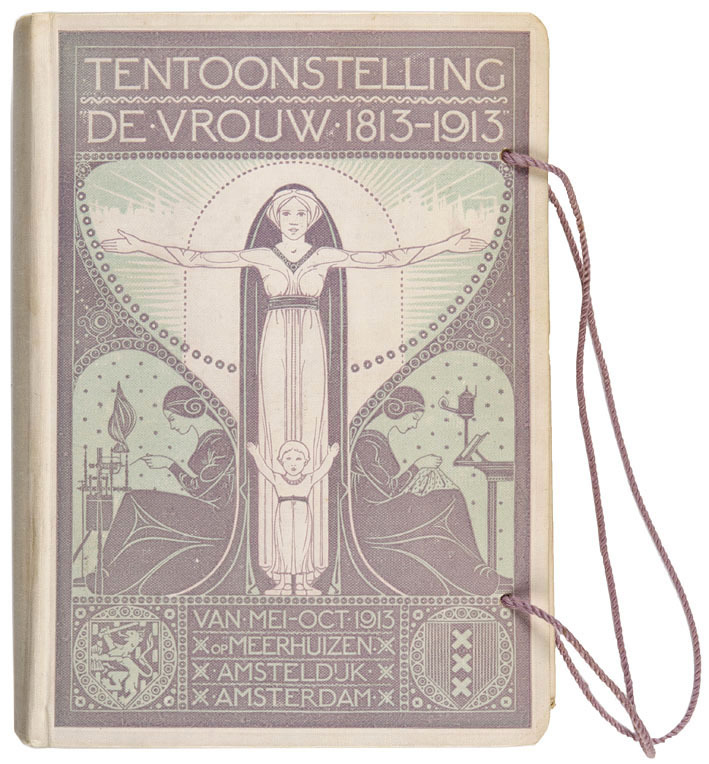 Willy Drupsteen’s design shows the past, present and future of the Dutch woman. In the background we see the plumes of smoke of the modern city, which were seen as a symbol of progress. The exhibition catalog could be carried as a ladies purse.